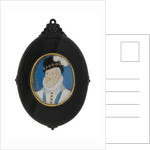 An oval miniature in watercolour on vellum, in an oval black carved wood display frame (possibly ebony), with a gilt slip, suspension hole and flower motifs. 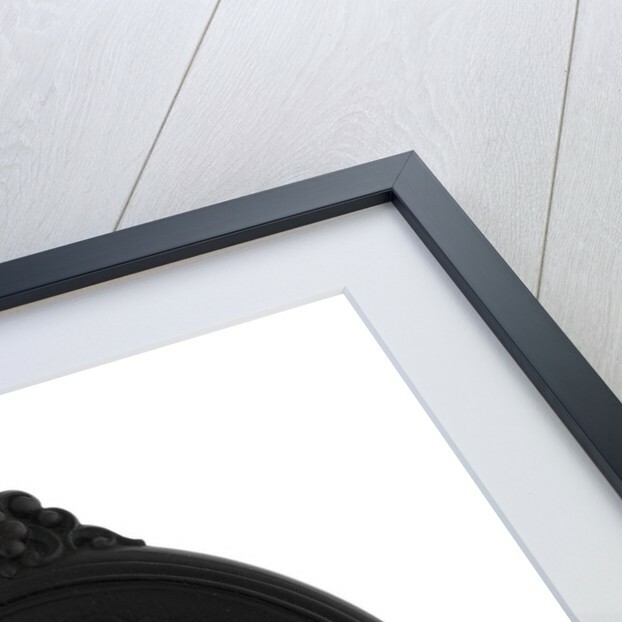 The image bears the integral inscription 'An[n]o. D[o]m[i]ni. 1605.' Formerly attributed to Hilliard, this depicts Charles Howard, most generally called Lord Howard of Effingham (though he became Earl of Nottingham from 1596). He is shown head and part-shoulders in the year he was 69, slightly turned to his right but looking out at the viewer. His short hair and neatly cut beard and moustache are almost white, his eyes grey. He wears a black hat with a white plume rising from a circle of gold-set jewels round the band, apparently the style appropriate to the Order of the Garter, also indicated by the blue ribbon round his neck. In a longer format this would have revealed the order's Lesser George badge suspended on it. Round his neck is a starched lace ruff, worn with a patterned white doublet, with jewelled buttons similar but not identical to the jewels of the hat. Howard was one of Elizabeth I's most important councillors and commanders by land and sea, and as a statesmen continued to hold high position under James I (from 1603), almost to his death. Lord Chamberlain from 1574 to 1585, he became Lord Admiral from 1585 to 1618. 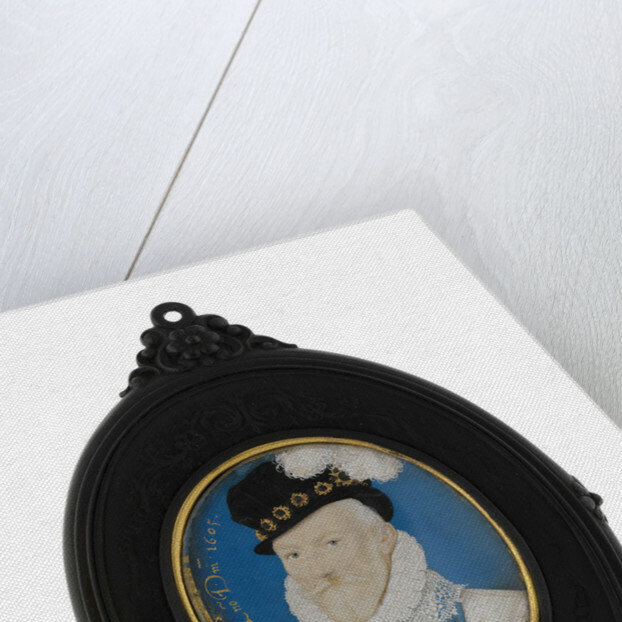 He was commissioner for the trial of Mary Queen of Scots in 1586, held chief command against the Spanish Armada in 1588, and was administrative founder of the 'Chatham chest', the original naval charity founded thereafter. In 1596 he held joint command with the Earl of Essex in the expedition against Cadiz, and was a commissioner for Essex's trial (and execution), in 1601 and for James I's coronation in 1603. In 1604 he was a commissioner for the union of crowns with Scotland, and for the trial of the 'gunpowder plotters' in 1606. 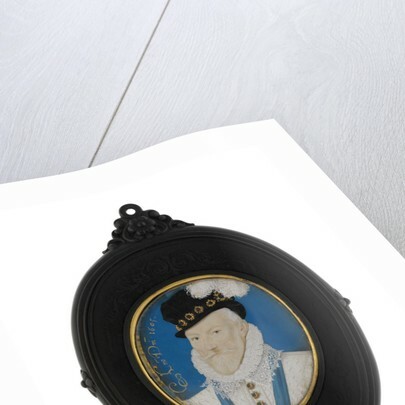 This miniature may mark his brief role as ambassador extraordinary to Spain in 1605. It was formerly in the collection of the Duke of Buccleuch, and until at least 1917 was identified as Lord Hunsdon by Nicholas Hilliard. When purchased and presented to the Museum by Sir James Caird, through Spink's on 26 October 1948, it was already re-identified as Howard and the Hilliard attribution lasted until at least 1961, when Erna Auerbach called it a fine late example. The basis for its more recent attribution to Lockey, which dates back to at least 1985, is uncertain. Lockey (c. 1566 -1616), was a painter and goldsmith, and a pupil of Hilliard. He began to work on his own about 1600 and became a member of the Goldsmith's company (as was Hilliard), in 1614. His pupils included John Langton from 1607, Raphe Blackmore in 1612, and his stepbrother, James Howson. His brother Nicholas was also a 'limner.' 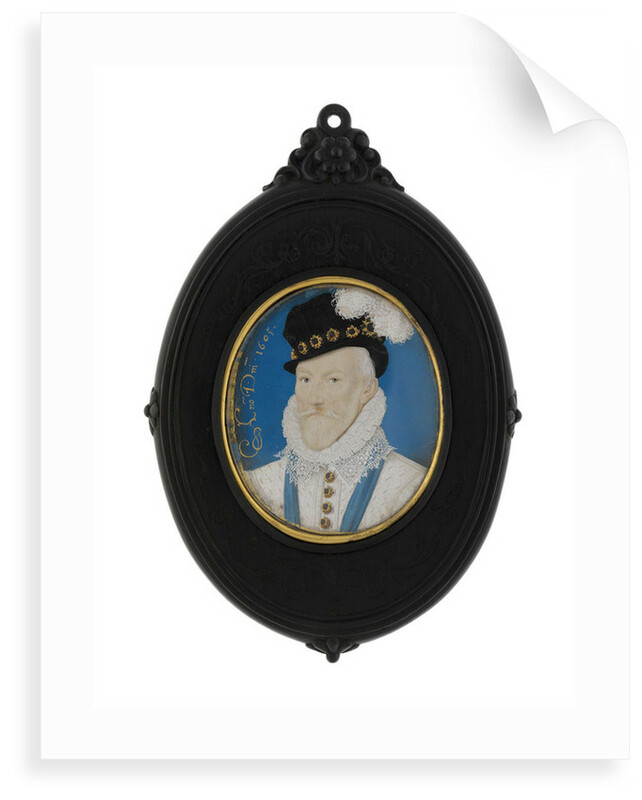 Though not identical, the frame is clearly a pair with that of F9599, also ex-Buccleuch, which was then believed to be Elizabeth I by Hilliard (and now an unknown lady by Isaac Oliver). The latter bears an inscription suggesting it once belonged to Horace Walpole at Strawberry Hill, which, depending on the age of the frames, the pairing suggests this may also have done. More by the artist Rowland Lockey.